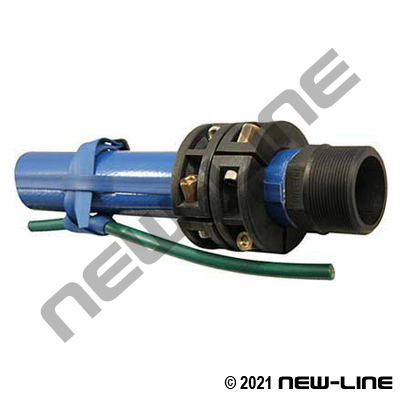 This is a specialty hose specifically designed for dropping/lowering submersible pumps into potable water wells. The hose is designed to hold the weight of the pump for lowering and retrieval and has a special power cable attachment band. It is available in very long, continuous lengths (over 1000ft in some sizes) and is NSF approved. It is available in several different brands as shown below. Typical Fittings: Specially designed male NPT or flange end fittings specifically for use on this hose. Construction: Tube: Smooth, polyurethane elastomer. Cover: Smooth, blue polyurethane elastomer. Reinforcement: High grade polyester fabric.